Live life to the fullest at every age! We all know balance is important, but as winter came to a close I decided to move and had an idea of exactly what I wanted my space to look like — neat, uncluttered, a sanctuary. I spent ten whole days painting, moving boxes, assembling furniture. I’d work until I couldn’t do anymore, fall asleep, then wake up the next morning to do the same thing. Lather, rinse, repeat. At the end of those ten days I had created the space I had dreamed of. The effect has been profound and the process was cathartic. I’d reached a goal, created a haven and had the perfect environment from which to make the changes I’m working on in my outside life. Spring cleaning has been an annual tradition for as long as I can remember. It makes sense to do these things during the transition of winter to spring — the bitter air becomes refreshing and the longer days inspire us to get things done. Whether you’re spring cleaning or remodeling a room, the effects have been psychologically proven to be beneficial for our mental health. Studies show that having a clean and comfortable space can help reduce stress and anxiety. Darby Saxbe, assistant professor of psychology at the University of Southern California, states that cleaning gives you a sense of control over your surroundings. “Life is full of uncertainty and many situations are out of our hands, but at least we can assert our will on our living space. Clutter can be visually distracting, too, and serve as a nagging reminder of tasks and chores undone,” Saxbe states. Her research suggests that those who find their home environment stressful have more depressed moods during the day, while those who find their home to be restorative experience fewer depressed moods. So what is it about tidying up that has this effect on us? The stress relieving benefits of cleaning may have an evolutionary basis. Martin Lang, Evolutionary Anthropologist, notes that the human brain likes predictability, as its helped us to survive in and utilize resources from our environment. When you clean, you move in repetitive, predictable ways, which our brain uses as a cognitive coping mechanism to reduce anxiety. How do you go about harnessing the power of spring to improve your environment? Aside from a full room renovation, there are many smaller ways to refresh your surroundings and revitalize your living space. Painting a single wall can liven up a room while bringing beneficial effects to your mind and body. Brighter colors will stimulate the mind, increasing energy but also potentially inducing anxiety. For a calming and stress relieving effect, cooler colors should be your go-to option. 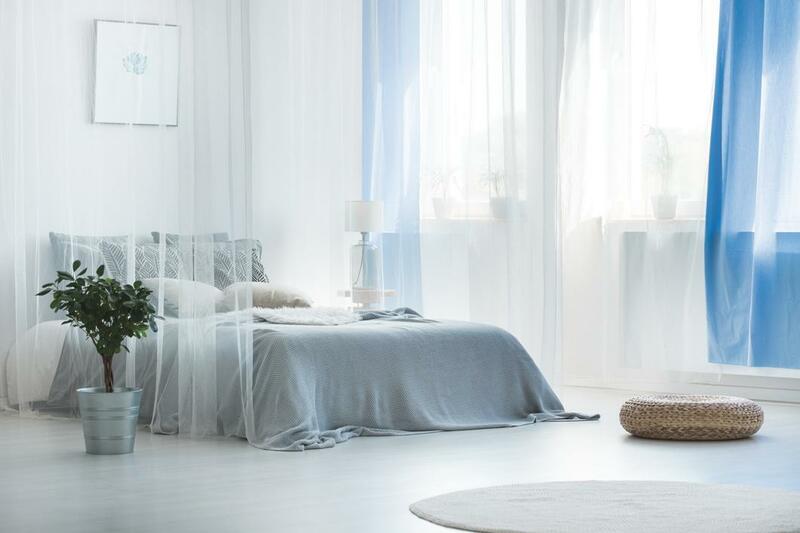 Soft shades of blue have been proven to calm the mind and even aid in falling asleep, making it a perfect color for the bedroom. Green is also a viable option as it reminds us of places we feel relaxed; the park, campgrounds, even your own backyard. For more suggestions on which color will best suit your needs, visit www.wow1day.com/blog/paint-colors/9-peaceful-paint-colors-help-you-relax/. If painting isn’t an option, it’s always possible to refresh the look of a room with decor. Accents such as new lampshades, window coverings, throw pillows and wall art in a color that creates the mood you’re seeking can completely change the feeling of a room. The room I had renovated was a fiery red color with dark accents, but when I painted it a fresh coat of white and added accents in cool blue tones, it turned into a space that feels airy, peaceful and calming. Simple additions like fresh cut flowers or potted plants refresh our minds by bringing the outdoors in. Surrounding yourself with nature at the tail end of winter gives way to spring. Besides visually appealing additions, our olfactory sense plays a big part in how we feel in a space. Consider adding candles in scents and colors that calm and uplift your spirits. I keep an arsenal of essential oils, incense and candles handy for a quick pick-me-up when needed. Using multiple senses to liven up a room will increase the mood you want to capture tenfold. And by all means, don’t forget the essentials. Most of us accumulate items that need to be stored, or clutter we didn’t have the energy to address during the long winter months. Discard or donate what’s no longer needed so you can find a home for new items you love. If necessary, tackle the dreaded paper monster by sifting through old files to make extra room. The less cluttered your space is, the more focused and relaxed you will feel when you’re inside it. And finally, keep the tradition of spring cleaning alive. Nothing feels better than throwing open the windows on a mild day (wear an extra sweatshirt if you need to), and getting rid of the dust bunnies that hibernated in your home all winter. The smell of cleanliness has a way of recharging us, and the feeling of accomplishment is invigorating. There are endless ways you can improve your surroundings to welcome spring and renew yourself. Whether renovating a room, tidying up in minimal ways, or making small changes, your mind and body will thank you.